EDMONTON - The Saskatchewan Roughriders (3-3) touched down in the Alberta capital at 2:00 pm local time Wednesday afternoon as they prepare for Thursday's Week 8 battle against the Edmonton Eskimos (4-2). 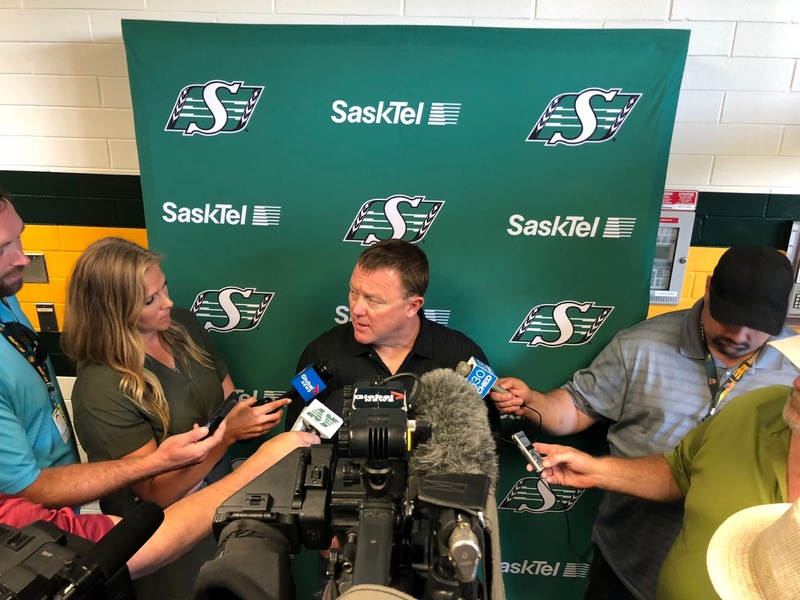 Roughriders Head Coach & GM Chris Jones fielded questions at Commonwealth Stadium about his quarterbacks ahead of the game. Veteran Zach Collaros is listed as the starter after being out since Week 2 with a concussion. A 3DownNation.com report stated that the Riders took a $50,000 salary cap hit to pull Collaros off the 6-Game Injured List two games early so it's reasonable to expect the Riders wouldn't take such a hit if they didn't plan to start the 7-year veteran. Jones was asked what Collaros brings that backups Brandon Bridge and David Watford did not. "That's kind of a divisive question," Jones said. "Our other QBs have played well. We won two football games with them, one on the road. They've done some nice things and Brandon Bridge is a guy we won with last year and he played in the playoffs. "For me to say anything negative about Brandon ... does Brandon have things to work on? Yeah. And he already knows what they are and we speak about them. Zach's been a very successful QB for a long time and we're looking for him to come in, not be Superman, not make mistakes, and just be Zach." Collaros said he's been preparing to return to the field for awhile. "It's been good," Collaros said of his rehab. "It's been kind of a two-week process of throwing and working out. The training staff has done a great job and I'm ready for some live action." The Riders have the CFL's 7th-ranked offense and 9th-ranked passing game so Collaros was asked if his return will provide a boost to those stats. "I think we always have high expectations," Collaros shrugged. "We put together a great game plan every week and it's up to the players to go out there and execute it. We've got the guys to do it. Regardless of what people outside of the locker room might say, we know we have the guys to do it." With rookie Nick Marshall returning to CB, veteran receiver Duron Carter has been shifted to slotback and Collaros was asked how much of a spark the pair can add to the Riders offense. "It doesn't come down to two players," Collaros explained. "It's 12 guys working as one. When all 12 guys are clicking, the spark becomes evident. You could credit to a person or two but that's not really the case. It's a team game and everybody has to be on the same page to get the results we want." Kickoff at Commonwealth Stadium on Thursday is 8:00 pm MT on TSN and the 620 CKRM Rider Radio Network.